Aerocoupe – This is the version of Monte Carlo SS with the sloping rear window, only available in the 1986 and 1987 production years. ALCL – Assembly Line Communications Link. This is the data connector under the dash above the driver’s right knee. ATDC – After Top Dead Center, referring to timing. Refer to TDC. BARO – Barometric Absolute Pressure Sensor – Measures Barometric pressure. Provides the ECM with altitude information. BTDC – Before Top Dead Center, referring to timing. Refer to TDC. B Pillar – The two pillars right behind the doors, in front of the 1/4 glass windows. C Pillar – The two pillars behind the 1/4 windows, in front of the rear window. C.A.R.B. – California Air Resource Board. The State of California governing body that regulates emissions in California. C.A.R.B. assigns numbers to aftermarket products that have been validated not to cause increased emissions. For a product to earn a C.A.R.B. number, the manufacturer must perform tests with the product in specific vehicles or engine types. Since California has the harshest emissions laws in the country, a product with a C.A.R.B. number is deemed 50 state legal for use in the specific application the C.A.R.B. number was assigned. CCV – Canister Control Valve – located in front of the carburetor. CID – Cubic Inch Displacement, as in 305 CID engine. Close Loop – Mode of ECM operation where it is controlling fuel delivery and spark advancement while monitoring exhaust gasses via the O2 sensor. Close loop only occurs only after warm-up and at idle/part throttle (not at WOT). COWL – Location at the base of the windshield. Basically, where the windshield wipers park. DIS.LACQUER – Dispersion Lacquer. Listed on the SPIL, indicates the type of paint used. E4ME – The model number of the CCC QuadraJet (Q-Jet) Carburetor used on the 4th Gen SS. L69 – RPO designation for the high output 305ci engine. LG4 – RPO designation for the standard output 305ci engine. MAP – Manifold Absolute Pressure Sensor – Measures changes in the intake manifold pressure which result from engine load and speed changes, and converts this to a voltage output. MCS – Mixture Control Solenoid, located inside the Q-Jet Carburetor. That’s the clicking noise you hear when you turn the ignition on, without starting the engine. Notchback – This is the standard Monte Carlo SS with the near vertical rear window, as opposed to the Aerocoupe model which has the sloping rear window. O2 – Oxygen Sensor – Mounted in the exhaust system where it monitors the oxygen content of the exhaust gas stream. Open Loop – Mode of ECM operation, where the ECM is not controlling fuel delivery and spark advance. The system will be in open loop if the O2 sensor is below 600 degrees F or at WOT. RPO – Regular Production Option, a list of these can be found on the Service Parts Identification Label on the inside of the trunk lid. SPIL – Service Parts Identification Label. 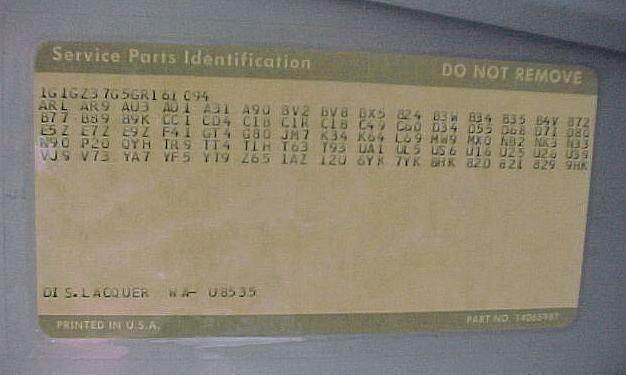 A tag that contains RPO codes located on the inside of the trunk lid. TACH – Tachometer, indicates engine RPM. TDC – Top Dead Center, referrs to the #1 piston at top of compression stroke. TH200-4R – This is the transmission available on the 1985 – 1988 Monte Carlo SS. It is a 4 speed with overdrive transmission. TPS – Throttle Position Sensor – A variable resistor mounted inside the carburetor float bowl. Tells the ECM the relative position of the throttle. VAC – Vacuum Sensor – Measures the difference between manifold pressure and atmospheric pressure (vacuum). WOT – Wide Open Throttle, what SS owners love to do! Accellerator peddal all the way to the floor. What makes a Monte Carlo SS an SS?